Green plants absorb energy from sunlight and change it into chemical energy during photosynthesis. They store the chemical energy in high-energy compounds, the most important of which are carbohydrates, especially glucose. The respiration process comprises the uptake of oxygen and the release of carbon dioxide (CO2). In the case of unicellulars, oxygen diffuses directly into the cell, and CO2 passes out as a bi-product. In the case of multicellulars, the presence of a respiratory system is essential. The uptake of oxygen and release of CO2 is called ‘gaseous exchange’, which is completely different from cellular respiration. Cellular respiration is the process by which energy is extracted from bonds of food molecules manufactured by plants or eaten by animals. The released energy is used in generating ATP (adenosine triphosphate) molecules. This passage is warm, as it is lined with numerous blood capillaries. This passage is moist, as it secretes mucous. This passage serves as a filter, as it contains hairs that act as a filter. The esophagus (that leads to the stomach). The trachea (which is a part of the respiratory system). The larynx is also known as the voice box. Air enters the trachea through the larynx. The trachea wall contains a series of cartilage rings which prevent the trachea wall from collapsing, thus maintaining an open passageway for air. The inner surface of the trachea is lined with cilia which beat upwards to create air and mucous currents. This impedes the entry of small foreign bodies and moves them to the pharynx, where they may be swallowed. The trachea is divided at its lower end into two bronchi. Each bronchus enters a lung, where it divides and sub-divides into progressively smaller and smaller bronchioles. Each bronchiole finally opens into one of the many alveoli (air sacs), of which there are about 600 million per lung. The thin alveolar walls are considered the actual respiratory surface, as they are surrounded with a large network of blood capillaries. Blood receives oxygen from the alveolar air and carries it to the rest of the body. It gives out CO2 to the alveoli in return, so that it may get rid of it. 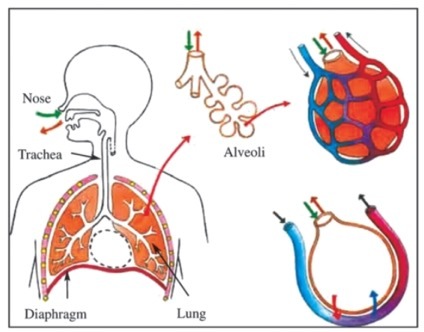 The whole group of alveoli and bronchioles connected to them, together with the huge network of capillaries, constitute the lung. All animals possess two lungs: a right lung and a left lung. The diaphragm: the respiratory muscle. The intercostals muscles: two groups of internal and external chest muscles that move the ribs. The internal muscles between the ribs contract, moving them up. The diaphragm muscle below the lungs contracts. The internal pressure of air inside the lungs is reduced. The outside air flows through the nose, downwards through the trachea and finally into the lungs. The volume of the chest cavity is reduced. Air is forced outside the lungs. The state of the individual between rest and exhaustion. The depth of the inspiration. At the end of expiration, some air is always left in the lungs to warm the new air coming into the lungs and to prevent the adhesion of the alveoli membranes from the inside. The human lungs are characterized by having a large surface area through which gas exchange occurs. The changes in the rate and depth of respiration are accompanied with similar changes in heartbeat. This is regulated by the center of respiration in the brain. The respiratory system in humans plays an important role in the excretion of water, as the expired air contains water vapour. Humans usually lose about 500 cm3 of water each day through the lungs, out of the 2500 cm3 of water that humans lose daily. This is due to the evaporation of water that moistens the alveoli membranes. This water is necessary for dissolving oxygen and carbon dioxide so that the exchange of gases between the air of the alveoli and the surrounding blood in the capillaries can occur.